Singer, Songwriter, Actor, Author and Recovery Advocate Paul Williams is one of the most beloved and respected music creators in the world today. A lyricist and composer who has won an Oscar Award, three Grammy Awards, two Golden Globe Awards and earned induction into the Songwriters Hall of Fame, his songs, from “We’ve Only Just Begun,” “Rainy Days and Mondays” and “You and Me Against the World” to “An Old Fashioned Love Song,” “Let Me Be the One” and “The Rainbow Connection,” have touched millions of people for generations. As President and Chairman of the Board of the American Society of Composers, Authors and Publishers (ASCAP), he is also a leading spokesman for music creators in the digital age. In 2015, Paul was honored with an Ivor Novello – PRS for Music Special International Award. Williams’ standards have been recorded by such diverse musical icons as Elvis Presley, Frank Sinatra, Barbra Streisand, Ella Fitzgerald, Ray Charles, David Bowie, Tony Bennett, The Carpenters, Luther Vandross, Willie Nelson, REM, Anne Murray, Gladys Knight, Diana Ross, Diana Krall, Sarah Vaughn, Sarah McLachlan, Jason Mraz, The Dixie Chicks, Gonzo and Kermit The Frog. Although Williams is widely known as an actor in dozens of films and on television, it is his musical legacy that continues to inspire. His songs and scores have received six Oscar, nine Grammy, six Golden Globe and two Emmy nominations. “The Rainbow Connection,” from the children’s classic The Muppet Movie, is one of two of Williams’ songs that grace the American Film Institute’s List of Top Movie Songs of All Time; the second, “Evergreen,” is from the award winning Barbra Streisand/ Kris Kristofferson remake of A Star Is Born. Additional song scores include the cult favorites Phantom of the Paradise and Ishtar, as well as The Muppet Christmas Carol, Bugsy Malone, and Emmet Otter’s Jugband Christmas, the latter of which has now been adapted for the stage. His recent work has remained wonderfully diverse, from creating the story and writing the songs for Disney’s Emmy-nominated A Muppets Christmas: Letters To Santa and penning the music and lyrics for Garry Marshall’s theatrical sensation Happy Days, to writing with the Scissor Sisters and Daft Punk. Williams is currently working with Gustavo Santaolalla on songs for The Book of Life before moving onto Guillermo del Toro’s stage musical adaptation of Pan’s Labyrinth. He has released twenty-four albums and provided songs and scores for dozens of films. The hit songs he wrote dominated the charts and became staples, including Three Dog Night’s “An Old Fashioned Love Song.” The Carpen­ters’ “We’ve Only Just Begun,” Oscar winning “Evergreen,” from the Barbra Streisand version of A Star is Born and the iconic “Rainbow Connection,” performed by Kermit the Frog in The Muppet Movie. His career, life, and work in recovery have been chronicled in the acclaimed documentary, Paul Williams Still Alive, for which Paul wrote the critically acclaimed title track. Sober twenty-five years, his humorous observations of life, love, and creativity, augmented by the education and knowledge he gained through his studies and certification from UCLA as a Certified Drug Rehabilitation Counselor, is shared in his book: Gratitude and Trust: Recovery is Not Just for Addicts co-written with Tracey Jackson. Recovery being his number one passion he considers writing this book the greatest opportunity of his lifetime to carry the message to the masses that recovery works for all. Tracey and Paul are also hosting the Gratitude and Trust Podcast. 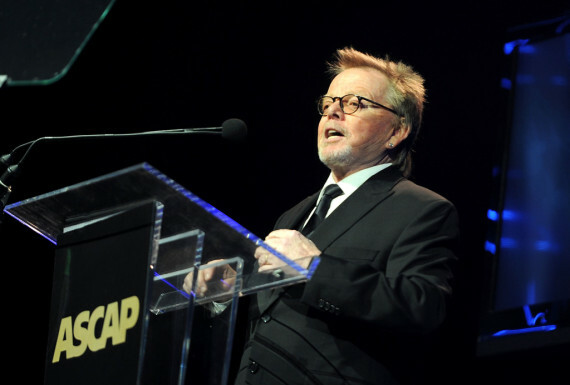 Since being elected ASCAP President and Chairman of the 450,000 + member organization, Williams has been a tireless advocate for defending copyright both at home and on the world stage. He has frequently lead delegations of some of today’s leading songwriters and composers to Washington, DC to visit with policymakers, discuss music creator rights and perform at the U.S. Library of Congress. He is a much sought-after speaker at conferences around the world for his vision, humor, knowledge of the issues and strong communication skills, as well as his gift for fostering common ground among diverse constituencies. As such, he is called upon often to testify before the U.S. Congress on vital Intellectual Property matters. Williams was also elected President of The ASCAP Foundation in 2009. He helps lead the public charity’s work in supporting American music creators and encouraging their development through music education and talent development programs, including songwriting workshops, grants, scholarships, awards, community outreach and humanitarian programs for songwriters, composers and lyricists. While publicly lauded for his work as a songwriter, performer, actor, leader and humanitarian, Paul predicts he’ll be remembered for playing Little Enos in the Smokey and the Bandit trilogy and for his lyrics to “The Love Boat” theme, although it is the lyrics from Bugsy Malone that aptly sum up his philosophy: “You give a little love and it all comes back to you; You’re gonna’ be remembered for the things that you say and do”. As a devoted husband to writer Mariana Williams and proud father, Paul considers his son Cole, and daughter Sarah, to be his best work.